With a contested primary in only one party this year, fewer Americans are closely following news about the presidential campaign than four years ago. As a consequence, long-term declines in the number of people getting campaign news from such sources as local TV and network news have steepened, and even the number gathering campaign news online, which had nearly tripled between 2000 and 2008, has leveled off in 2012. 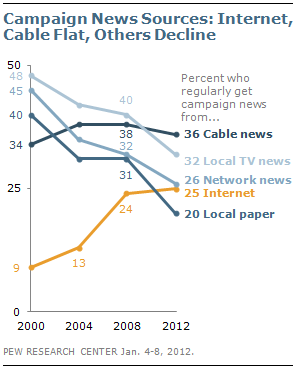 In contrast to cable, the Pew Research Center for the People & the Press’ 2012 campaign news survey, conducted Jan. 4-8 among 1,507 adults nationwide, finds broad declines in the numbers getting campaign news from newspapers, and local and network TV news. Just 20% say they regularly learn something about the presidential campaign or candidates from their local daily newspapers. 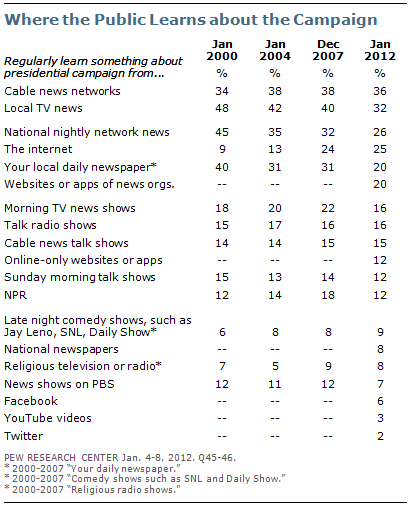 In 2008, 31% said they got campaign news from their daily newspaper and 40% did so in the 2000 election cycle. Bear in mind they’re talking about the presidential campaign — if I can find some data on local campaigns and media sources I’ll post it. Many of the newest internet tools for getting campaign information, including social networking, are being used by a relatively limited audience. One-in-five Americans (20%) say they regularly or sometimes get campaign information from Facebook and just one-in-twenty (5%) say the same about Twitter. Even among Facebook and Twitter users, most say they hardly ever or never learn about the campaign or candidates through those sources. Need more proof that newspapers have made a comeback when it comes to political news and advertising? 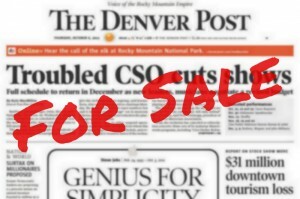 In the 2002 elections, the newspaper industry collected a paltry $35 million for political advertising. It’s likely that more money was spent on bumper stickers that year. But fast forward to 2010 and the newspaper industry increased their take nearly tenfold to over $300 million in political ad sales. I couldn’t find the study they cite online so the numbers are a little lacking since there’s no context — I’d like to know the percentage of newspaper political ad sales in relation to overall political spending. There are more interesting graphs on the Pew story, so click on through.